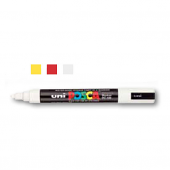 All our glass markers, paint markers, posca markers and grease pens are specifically designed to be used on auto windshield glass or as car window advertising markers. Automotive dealerships are not the only businesses that use windsheild markers for advertising and inventory control. Markers are also used by auto auctions, body shops, motorcycle, RV, tire and motorsport dealerships. For example, auto body shops use marker pens to outline repairs and mark areas included in the estimate. We carry marking pens which are perfect for your dealership's showroom, sales lot and service or body shop department. 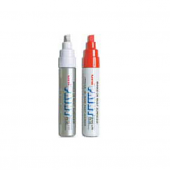 Our markers are high quality, brand name marking pens and paint. We have sunproof markers, glass paint markers which dry quickly, sharpie markers for permanently marking auto dealer key tags, waterproof Posca paint markers and many other useful marking pens used by car dealerships and repair shops available for purchase online. These Wide Tip Paint Markers (Over 1-1/8" wide) are 30 mm, bright bold colors and quick drying. These markers are waterproof, water-based and fade proof and available in Standard Colors (Yellow, Pink, Green and Orange). These Permanent Markers are fast drying and water resistant. They are xylene free, low odor, and ROHS compliant. 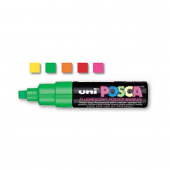 These Windshield Markers - Small (1/4" tip) are Uni Posca Paint Markers with bright bold colors and quick drying. These markers are waterproof, fade resistant and available in Fluorescent Colors (Yellow, Green, Orange, Red & Pink).